Fittings and connectors that are intended to be concealed at the time of on-site assembly, where tested, identified, and listed to applicable standards, shall be permitted for on-site interconnection of modules or other building components. Such fittings and connectors shall be equal to the wiring method employed in insulation, temperature rise, and fault-current withstand and shall be capable of enduring the vibration and minor relative motions occurring in the components of manufactured building. Are these allowed in other types of construction for industrial, commercial, or residential use? The "Manufactured housing" industry has argued strenuously that the controlled factory environment, quality control measures, and extensive engineering involved all make a good case for allowing them to do things that would otherwise not be allowed. This argument does haqve some merit, and has been successfully used many times. Moreover, the products are typically listed as assemblies- without there being any listing of individual components. I would frown upon the use of these parts elsewhere- there is a lot more to consider than "does it work today?" Rather than simply saying "no sticker, no approval," I would hope that an inspector would take the time to compare the item to listed components, review the various product standards, and consider the qualifications of the parties involved. It really does seem unfair for ABC Mfg. to be allowed to do something that Joe Tradesman cannot. We also have a culture that rewards initiative, ingeninuity, and expects individual responsibility. This is the antithesis of the "nanny state," where everything needs approvals from sundry parties. If it isn't specifically forbidden, it is allowed- in my book. 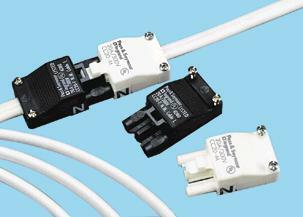 Yes, they are used extensively in control system wiring, A-B makes a system that uses a flat cable that carries both power and signal voltages. The blocks then are attached to the cable piercing the inuslation. Forgot their product name, but the biggest problem is people moving the block after the wires have been pierced leaving an open connector accesible to damage, short circuit etc. I notice AMP has removed the language from their instructions that said these were compliant with 334.40 but if you have old devices laying around it will still be there. When we first had this conversation in the late 90s I got some samples and they were recomended for things like pigtailing NM-b to old NM and concealing the splice for feeding ceiling boxes. The thought was you could knock out the old box, clip on a short section of NM-b and replace the box with a new one. This is one of those situations like the Ideal 65 wirenut and pigtailinmg aluminum. The manufacturer was saying it was OK, U/L seemed to agree and there was supporting language in the code but inspectors hated it.